Glissando Harps features a Camac and a Salvi 47-string Concert Harps sampled in full detail. Each Harp was sampled in a different venue and with different setups in order to augment flexibility and usage scenarios. The very reason Chocolate Audio embarked on sampling a concert harp in 2012 was to achieve a flexibility never heard before with sampled harps. The sound of the harp is unmistakably linked to the Glissando technique, where the harpist runs her/his fingers through the strings creating a dreamy and catchy sound unique to the harp. 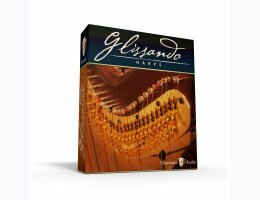 Their Glissando engine lets you play Glissandos at any speed, in any tonal center and setting playable on a real harp, in any tuning, any scale, any chord. When using the Glissando Mode you're left with only the white keys (as the harp features 7 strings per octave) and change the tuning of each string by switching the positions of the Pedals via MIDI or GUI. Chocolate Audio created a selection of the most used tunings in the section on the right to give you a quick way to get the Glissando you want.